In a battle of cats versus dogs, the felines came out on top. 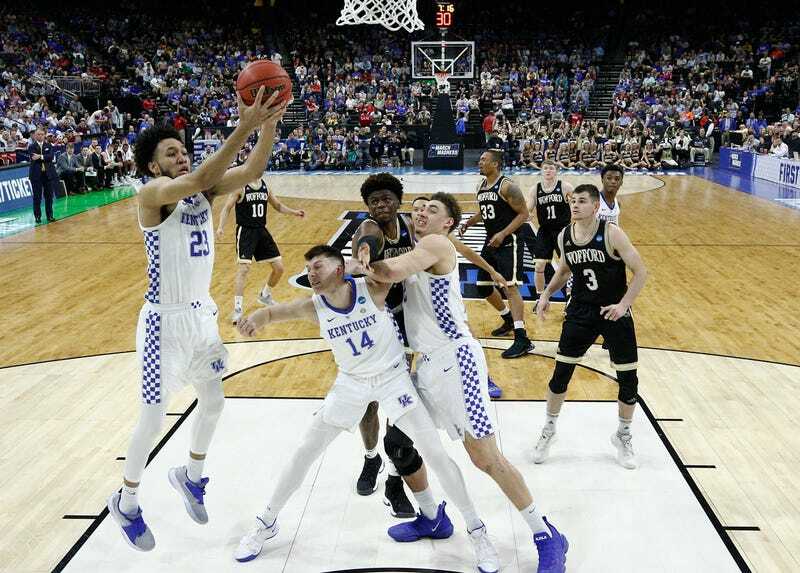 The Kentucky Wildcats held on to beat the Wofford Terriers, 62-56, in a second-round NCAA men’s basketball tournament game this afternoon. The Wildcats, lambasted for their perimeter defense all season, held Wofford to just 8-for-27 shooting from three point range. Fletcher Magee, who has made the most threes in NCAA history, went 0-for-12 from behind the arc. Wofford led for most of the first half, though Kentucky came back to take a 28-26 lead at halftime and kept the Terriers at paws-length for the most of the second half. Reid Travis led the Wildcats with 14 points; Ashton Hagans was the only other Kentucky player in double figures with 12. Kentucky, the second seed in the Midwest, advances to meet the winner of tomorrow’s Ohio State/Houston game.